You can now take your Instagram filter with you | HELLO! If you've ever wanted to make your favourite Instagram filter real life, then this new hair trend will be right up your street. Introducing rose filter hair – the new hue inspired by the picture sharing app. 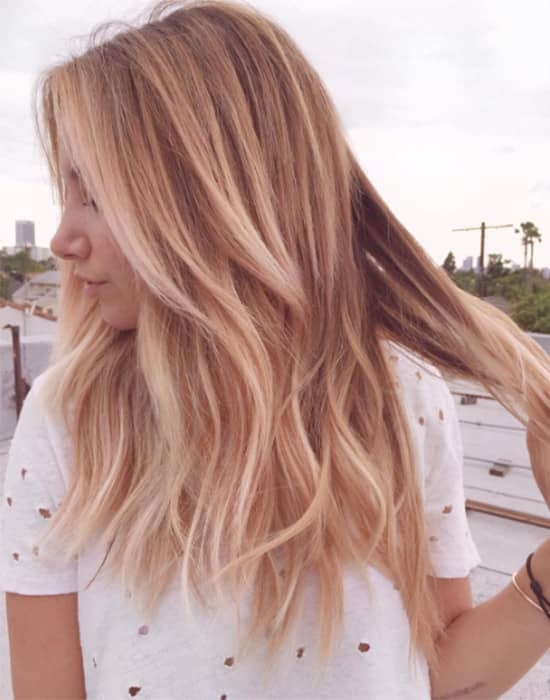 The colour is made up of blonde and copper, and actress Ashley Tisdale debuted the look – on Instagram, of course – last week. Her look was an instant hit with followers, which is unsurprising given its flawless finish. Ashley's hair stylist Kristen Ess revealed her new look is supposed to resemble blonde hair with a filter, but that the High School Musical star wanted to turn her favourite edit into real life. Kristen told People: "It legitimately came from the way blonde hair looks when there's a rose filter on the photo. Only [she] wanted it to look like that all day every day." We don't blame Ashley: she looks amazing! After lightening Ashley's hair with platinum streaks, Kristen added brunette before finishing off with a rose tint near the roots. She also had lots of choppy layers added to her extensions to help the new colour really dazzle in the light. And Ashley's not the only celeb to rock the trend. Emma Roberts recently showed off her own version of the rose filter locks, which has sparked a huge Instagram trend. It's the perfect look for someone who wants a seasonal change, but isn't feeling brave enough to rock the mermaid trend. Will you be trying rose filter hair? Let us know in the comments section below.